With your giving pages up and running, you are now ready to bring in the big bucks! Let's start with a set of constituents you want to target - use a list, return to a saved segment, or start fresh by applying new filters to your constituent base. From there, EverTrue has created an easy-to-use Give Appeal button that generates a CSV file of your desired set of constituent for solicitation. Take that CSV to any email marketing software or email client and begin your solicitation! Watch the video below to see how it works. *A single primary email must be present on the constituent's record for an email to populate in this field. If no primary email has been indicated, this field will be blank for that constituent. If more than one primary email was indicated, this field will take the first recognized primary email. Best practice is to include only one primary email per constituent. You can use the filter "Has Primary Email Address?" to create an appeal with only those constituents if you choose. 1. From either a List, Segment, or new search, open the "Actions..." dropdown menu and select " Create Give Appeal." 2. Select the Give page you would like to solicit for and name your appeal. 3. Next, click "Export Appeal" and the creation of your CSV file will begin! You'll be able to watch the status of your appeal in the pop-up module near the top-right corner of your screen. 4. 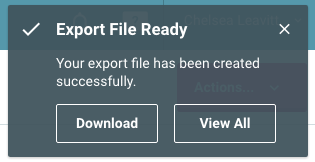 Once complete, that same pop-up module will display "Export Ready" and give you the option to "Download" immediately or "View All." Clicking "View All" will take you to your Recent Exports (located in your user drop-down menu in the upper-right corner of your screen), where you can download this or any other CSV file you've generated in EverTrue. Final steps? Take that CSV, upload it into any email marketing software or use a simple mail merge, and you're set!